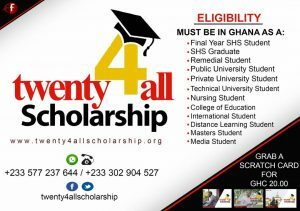 Twenty4All Scholarship is an initiative by Abba Foundation to waive off academic user fees for its qualified applicants. To be eligible, you must be a final year student or an Shs graduate, a remedial student, Undergraduate students of all nationals schooling in Ghana, Both fee paying and non – fee paying students, Private/ Technical Universities, Teacher and Nursing Training Colleges. Just like every other organization that gives out scholarship packages, they look to give out these packages to excellent and promising students. To be a beneficiary of the scholarship, you must first take an online quiz, every applicant is required to meet the pass mark of 14/20. Shortlisted applicants will be contacted for an interview. Maximum Scholarship Offer Gh¢3,000 / 650USD. This initiative by Abba Foundation would be launched on Feburary 27, 2018. Venue for the launch is British Council, Accra. Time is 9am prompt. Applicants can start applying on Feburary 27, 2018. Deadline for application is June 30, 2018. For more information, Contact Abba Foundation on 057 723 7644 / 030 290 4257.